1950 (May 29): Oberto Airaudi was born in Balangero, in the province of Turin, Italy. 1967: Airaudi published his first book, Poesie dei miei sedici anni (Poems of a sixteen years old). He also produced his first painting, Pensiero già arrivato ai primi segni ritrovati, collaudati in verità (My thought has just arrived to the first symbols, and they have been rediscovered and proven true). 1969: Although the legal age in Italy at that time was twenty-one, Airaudi successfully petitioned the Court of Turin to be recognized of age at nineteen and marry. 1975: Having abandoned his activity as an insurance broker, Airaudi founded in Turin the Centro Ricerche e Informazioni Horus (Horus Research and Information Center), devoted to esotericism, naturopathy, and parapsychology. 1970s: Airaudi became part of the artistic avant-garde milieu in Turin, and was particularly influenced by the Concrete Art Movement and by painter Filippo Scroppo. 1975-1977: Airaudi first conceived the idea of an esoteric community and started purchasing land in the Valchiusella valley. 1979: The first community of Damanhur was inaugurated. 1980 (ca. ): Airaudi started producing his signature “Selfic” paintings. 1992: The Temples of Humankind, kept secret for years, were “discovered” through the revelations of a disgruntled former member, and they became public knowledge. 1996: With the settlement of the corresponding legal cases, Airaudi and Damanhur became legally entitled to open the Temples of Humankind to visitors. 2004 (September): The “selfic cabin,” where Airaudi’s paintings were exhibited, was inaugurated within the Niatel art gallery in Vidracco, Piedmont. 2011 (May): The first “selfic cabin” outside Italy, known as the Hawks Hill Cabin, was inaugurated in a private home in the Scotts Valley, near Santa Cruz, California. 2013 (June 23): Oberto Airaudi died in the nucleo-community of Aval, located in Cuceglio, in the province of Turin. His followers believe that he continues to paint through students-mediums whom Airaudi himself prepared. Oberto Airaudi (1950-2013) [Image at right] is mostly known as the founder of Damanhur, a federation of communities with distinctive spiritual teachings inspired by Theosophy, the religion of ancient Egypt, and Western esotericism. Some 600 “citizens” of Damanhur live in more than twenty communities scattered around the Valchiusella valley, located thirty miles out of Turin, Italy, and another 400 live nearby, with “centers” catering to those who are interested in Damanhur’s worldview in several Italian and European cities, in the United States, and in Japan. Although at that time the legal age in Italy was twenty-one, at nineteen Airaudi successfully petitioned the court if Turin to be recognized of age and marry. He became the youngest licensed insurance broker in the region, but he also maintained a strong interest in alternative spirituality and healing. In 1975, having abandoned his activity as an insurance broker, Airaudi founded in Turin the Centro Ricerche e Informazioni Horus (Horus Research and Information Center), devoted to esotericism, naturopathy, and parapsychology, and became a popular esoteric lecturer in the region. Between 1975 and 1977, Airaudi first conceived the idea of an esoteric community and started purchasing land in the Valchiusella valley. In 1979, the first community of Damanhur was inaugurated and Airaudi’s social and spiritual experiment eventually grew to become the largest New Age-esoteric commune in Europe. It includes now schools for children (Introvigne 1999a) and a sizable number of second generation members. In Damanhur, Airaudi took the name of Falco Tarassaco. In Italian, Falco means “hawk,” and “Tarassaco” is Italian for Taraxacum officinale, the common dandelion, which has healing properties. While the community, or rather communities, of Damanhur have been frequently described by scholars of new religious movements and intentional communities and journalists (see e.g. Berzano 1998; Merrifield 1998; Introvigne 1999b), Airaudi’s artistic activity has received less attention. 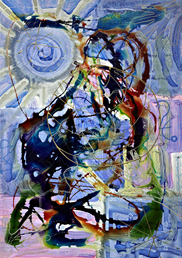 Airaudi, however, always regarded himself as an artist as wells as a community leader, and art maintains a central role in Damanhur’s spirituality (Zoccatelli 2016). Before founding Damanhur, Airaudi became part of Turin’s artistic avant-garde. 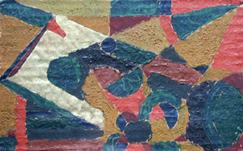 He was particularly influenced by the Concrete Art Movement. This Italian movement was founded in 1948 to promote non-figurative art, in particular art with a strong emphasis on abstraction, free from imitation and reference to the outside world. The term “Concrete Art” had been coined in France by the Dutch artist Theo van Doesburg (born Christian Emil Marie Küpper, 1883-1931), closely associated with the De Stijl (The Style) art movement, also known as Neoplasticism, and strongly influenced by Theosophy. Although van Doesburg was not a member of the Theosophical Society, he knew about Theosophy through the most important artist and theorist of De Stijl, fellow Dutch painter Piet Mondrian (1872-1944), who was a member of the Society for all his life. An examination of Airaudi’s early paintings evidences the influence of Filippo Scroppo (1910-1993), a pastor of the Waldensian Church, the oldest Italian Protestant denomination, and a prominent representative of the Concrete Art movement in Turin [Image at right]. This is not surprising, as the young Airaudi and the Concrete Art painters were part of the same Turin avant-garde milieu and shared a common interest in Theosophy. After the foundation of Damanhur, Airaudi’s artistic creativity was mostly devoted to direct the construction of the underground Temples of Humankind, whose existence was kept secret by Damanhur for more than twelve years. Only in 1992, through the revelations of a disgruntled ex-member, did the media and the Italian authorities discover the underground temple. Tax and zoning authorities claimed that it had been built illegally and threatened to destroy it. The legal cases, however, were settled in 1996, and from then on Damanhur was legally entitled to keep its temple and to open it to visitors. In the first years of media attention after the discovery of the temple, Damanhur welcomed 50,000 visitors per year. More recently, the number has stabilized around 20,000 (see Esperide Ananas and Stambecco Pesco 2009). Art in general is of central importance in the spiritual experience of Damanhur. In the philosophy of Airaudi, art is perceived as a unique carrier of spiritual teachings. “I produce paintings,” Airaudi said, “because there are things I can only write in this way. With my ‘Selfic’ Paintings I try to give an aesthetic idea of my esoteric message” (Arciere Aglio 2006:5). “Selfic painting” is the name Airaudi gave to his own art. In fact, Selfica is one of the most peculiar beliefs within the philosophical and spiritual system of Damanhur. The words “Self” and “Selfica” are not part of the Italian language. “Self” is, of course, an English word. Airaudi borrowed it, but changed its meaning to designate the spiral as a fundamental form of life. For the Damanhur community, Selfica is also a field of spiritual research and a science, by which Damanhurians try to contact energies and intelligent beings from other dimensions and planets. They use rituals and “Selfic machines” to mobilize the special energy associated with the spiral form. They believe that the science of Selfica was known in the ancient Egyptian, Etruscan, Celtic and Minoan cultures. The basis of Selfica is the notion that the spiral form is endowed with special powers. Devices and “machines” (“Selfs”), based on the spiral form and constructed of certain metals, colors, special inks, and minerals, are built in Damanhur to be used as catalysts to attract forces and beings from other planes of existence. Building a Selfic structure, Airaudi taught, is like constructing bodies that these forces and beings may claim as their own and use. It is also an aesthetic and artistic experience. In Airaudi’s Selfic paintings, the function that spirals made of wire perform in the “Selfic machines” are performed by colors, which translate three dimensions into two. Selfic paintings, Airaudi believed, “are kept active by light and the attention of their observers. The colors, forms and signs are alive, animate and in constant transformation. They project signals and information to the surrounding environment and the viewer” (Esperide Ananas 2004:A II). The key for reading Selfic paintings is given by Airaudi’s combination of colors, forms, and titles, with the latter always expressed in poetic form. Almost all Selfic paintings manifest various characteristics when viewed under different conditions of light. For example, daylight and ultraviolet light reveal different layers, and as a consequence, different meanings in each painting. When Selfic paintings are placed alongside one another, they create effects different from those of a single painting, because they “live” in symbiosis and interact with one another in the mind of the viewer. Damanhurians explain that a maximum amplification of the paintings’ functions can be obtained within a Selfic cabin. It is a structure created by the display of at least thirty-three Selfic paintings, if possible from different periods, with different themes and sizes, along with a spherical Selfic machine called a “Spheroself.” The Selfic machine consists of wire spirals and a sphere that contains a “special alchemical liquid” (Selet online catalog n.d.). The Niatel gallery, located in the town of Vidracco, in the arts and wellness center open by the communities to the public called Damanhur Crea, houses a permanent exhibition of Selfic paintings. Known as “Niatel, Galleria dei Quadri Selfici di Oberto Airaudi” (Niatel, Gallery of Oberto Airaudi’s Selfic Paintings), it is the most complex “Selfic cabin” in the world. According to Esperide Ananas, who has been living in Damanhur for over twenty years, where she conducts research in the field of Selfica, “a Selfic cabin is a true gateway to higher energies and intelligences, a space for amplifying therapeutic effects and the ideal place to work on perceptions, dreams, and to reach a state of increased integration and mental harmony” (Esperide Ananas 2013:189). In addition to the cabin created at Damanhur from the permanent exhibition of Airaudi’s Selfic paintings, there are other cabins worldwide, located in the United States, Japan, and Croatia. The first one outside of Italy, known as the Hawks Hill Cabin, opened in late May 2011 in a private home in Scotts Valley located in the mountains behind Santa Cruz, California. The Hawks Hill Cabin is becoming the heart of a Damanhurian community that meets regularly for meditation and research, and is called the “Selfic Temple” by its Californian users. All the heavens in your hands, just as the shadows owned by the universes. We will have new equilibriums, and powers to explore. The geometries, in movement, will have adventure, the stars will shine in the extreme and cold darkness, heating new worlds. In you, synchronic moves, reflected thought, magic acts will develop. I am the visible key, the mystic door to the inner heavens. I welcome and reflect, pulsate and combine frequencies until I reach outside of times, of time. Aeonian intelligences assist to brief acts, hesitations, hints of power difficult to understand, for now. Liquid densities wait from above, impatient spiritual beings come and go from this birth-room, they attract waves-soul, for you. The hearts (where there are hearts) beat appropriate rhythms, ritual, moving, they ordered thought and theurgic magic. I am, observed, the door-frequency that half-closes itself, and that the sensitive knows how to dance, still hesitating. It is this the right behavior. All the heavens in your hands, now, just as the shadows owned by the universes… (Tempia Valenta 2004:AIII). Oberto Airaudi’s Selfic paintings may be read on two levels. On the one hand, Airaudi was not an amateur artist and his work is a legitimate part of the Turin avant-garde of the twentieth century, expressed in such movements as the Italian version of Concrete Art. Airaudi’s paintings are open to iconographic readings of colors and forms, which find parallels in the Concrete Art style originating with Theo van Doesburg and passing through Filippo Scroppo and others. On the other hand, the emic reading by Damanhurians of the Selfic paintings is less interested in their artistic style and sources. For the members of the Damanhur community, Airaudi’s Selfic paintings are spiritual artifacts and ritual objects. 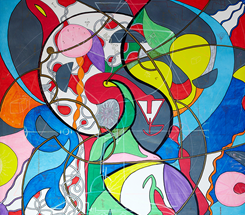 Similar to the complicated Selfic machines, Airaudi’s paintings are regarded as portals capable of attracting intelligent energies and, ultimately, of saving the world from impending doom through the mystical power of the spiral form. Image #1: Photograph of Oberto Airaudi. Image #2: Photograph of Pensiero già arrivato ai primi segni ritrovati, collaudati in verità (My thought has just arrived to the first symbols, and they have been rediscovered and proven true). Image #3: One of Airaudi’s early paintings evidencing the influence of Filippo Scroppo on his work. Image #4: Photograph of one of the rooms in The Temples of Humankind, a huge subterranean complex comprised of a fantastic collection of richly decorated rooms and galleries. Image #5: Photograph of one of Airaudi’s Selfic paintings. Image #6: Photograph of one of Airaudi’s most notable Selfic paintings. Airaudi, Oberto. 2011. Stories of an Alchemist: The Extraordinary Childhood Years of the Founder of Damanhur in 33 Tales. Vidracco, Italy: Niatel. Arciere Aglio [Gianluca Gallerani]. 2006. I Quadri Selfici di Falco. Raccolta ragionata delle conoscenze attuali, dalle serate e i corsi di Oberto Airaudi. Unpublished typescript for internal circulation in the Damanhur community. Berzano, Luigi. 1998. Damanhur. Popolo e comunità. Leumann. Turin: Elledici. Esperide Ananas [Silvia Buffagni]. 2013. Spirals of Energy: The Ancient Art of Selfica. Vidracco: Devodama. Esperide Ananas [Silvia Buffagni], and Stambecco Pesco [Silvio Palombo]. 2009. The Traveler’s Guide to Damanhur: The Amazing Northern Italian Eco-Society. Berkeley: North Atlantic Books. Esperide Ananas [Silvia Buffagni]. 2006. Damanhur: Temples of Humankind. New York: CoSM Press. Esperide Ananas [Silvia Buffagni]. 2004. “La Pittura Selfica – Selfic Painting.” Pp. AI-AII in Tempia Valenta 2004. Introvigne, Massimo. 1999a, “Children of the Underground Temple: Growing Up in Damanhur.” Pp. 138-49 in Children in New Religions, edited by Susan J. Palmer and Charlotte Hardman. New Brunswick, NJ: Rutgers University Press. Introvigne, Massimo. 1999b. “Damanhur: A Magical Community in Italy.” Pp. 183-94 in New Religious Movements: Challenge and Response, edited by Bryan Wilson and Jamie Cresswell. New York: Routledge. Introvigne, Massimo and PierLuigi Zoccatelli. 2010. “Damanhur.” Pp. 852-54 in Religions of the World: A Comprehensive Encyclopedia of Beliefs and Practices, Volume II, edited by J. Gordon Melton and Martin Baumann, Second Volume. Santa Barbara, CA: ABC-Clio. Merrifield, Jeff. 1998. Damanhur: The Real Dream. London: Thorsons. Selet. n.d. “Spheroself.” In Selet, online catalog. Accessed from http://www.sel-et.com/en/products-eng/high-technology-selfica/spheroself-detail on 12 March 2017. Tempia Valenta, Eraldo, ed. 2004. Quadri Selfici di Oberto Airaudi. Turin: Il Mettifoglio. Zoccatelli, PierLuigi. 2016. “‘All the Heavens in Your Hands:’ Oberto Airaudi and the Art of Damanhur.” Pp. 145-62 in Nova Religio: The Journal of Alternative and Emergent Religions 19:145-62.